This Maldives setup beats Kelly’s wave pool. So machine-like… – Photo Nathu. I’ve often reflected on his comment and adopted it when appropriate since. It is exactly the way I perceive the Maldives. I view the entire region as an incredible, natural, living, breathing, fun, water park. The whole set up is almost too good to be true, right? Its perfect, there’s no real hazards: It is politically stable. No terrorism. Yes, there’s sharks, but they are generally well fed and mostly harmless reefies. No history of attacks. 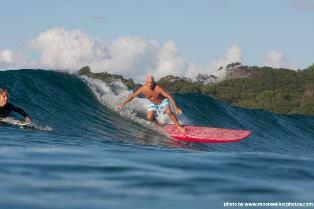 Yes, the waves break on reefs, but there are no real death slabs or super shallow/sharp Indo or Sth Pacific style reefs. There’s lefts, rights, fun walls and hollow sections – literally something for all standards from shredders to absolute beginners and everyone in between. The variety and quality of food, service and accommodation on our charter boats or land resorts is insane, and yes, you can enjoy a relaxing alcoholic beverage without being harassed. The whole region really is some kind of fantasy surfing Garden of Eden with waves. The closest thing I could compare the best waves in the Maldives with would be Kelly’s new wave park prototype. However, the key difference is the Maldives is real, you are dealing with nature and all its wonderful variables. Kelly’s wave pool remains a research and development project. It especially makes sense to book before Christmas to take advantage of The Perfect Wave’s Early Bird deals. We have something for everyone – exciting charter and land based options, catering for families, couples, singles or groups of friends. 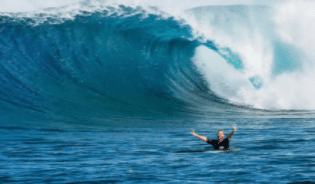 The Perfect Wave is very proud to team up with Bob McTavish to offer you the following unique surf experience: Maldives surf charter Carpe Vita with the legend. Share this boat with Occy and Jay for an epic experience for both surfers and their groms. A great surf photography option with Andy Potts will ensure some epic images and video content. The Perfect Wave surf guides will show you Male Atolls and beyond. The Perfect Wave is very proud to team up with Barton Lynch to offer you the following unique surf experience: Maldives surf coaching clinic with Barton & Holly Lynch on board the luxurious Carpe Vita Surf Charter. Barton Lynch will help you with your knowledge of the ocean and the breaks you surf and show you how to manage the lineup to catch more waves. There will be a focus on learning the correct techniques and style for all the manoeuvres. Australia’s Queen of the surf is hosting a coaching trip in paradise with her husband, legendary shaper Mark Rabbidge at Kandooma Resort, the Maldives. Pam Burridge will give you plenty of coaching tips and guidance. The best family surf holiday in the world is….. offering 20% off now!